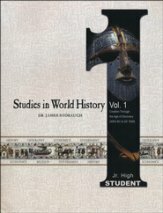 World history is combined with social studies in a one-year course. The Jr. High School student will see history come to life no matter what their pace or ability. Developed by Dr. James Stobaugh, the courses grow in difficulty with each year, preparing students for high school work. This is a comprehensive examination of history, geography, economics, and government systems. This educational set equips students to learn from a starting point of God's creation of the world and move forward with a solid biblically-based worldview. Volume I Covers - The Fertile Crescent, Egypt, India, China, Japan, Greece, Christian history, and more.